With this rapid growth, the need for a Catholic Church was soon evident. That first church, a small wooden structure located just north of the existing church, was built in 1876. In January 1883 it was decided to build a parish school. During the spring and summer the building was constructed. It was placed along the northeastern end of the property; it was about 60 feet long, 40 feet wide and two stories high. There was space for four good-sized classrooms (only two were used at first). The second floor was furnished as a home for the Sisters. The school was opened the fall of 1883. The direction of it was entrusted to two Sisters of Saint Francis and two postulants from Rochester, Minnesota. About 90 pupils enrolled. The four classrooms served the needs of the parish until 1911 when more space was needed. The two story, 20-room school, which today serves as our elementary school, was completed in the fall of 1914. 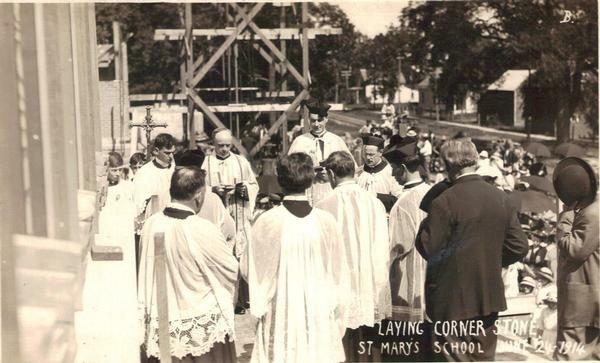 The cornerstone was blessed and laid on June 24, 1914. It was occupied at the beginning of the second semester in January 1915. The total cost of the building and furnishings was $63,644.95. At the close of the year 1917 all was paid with the exception of $7,000. 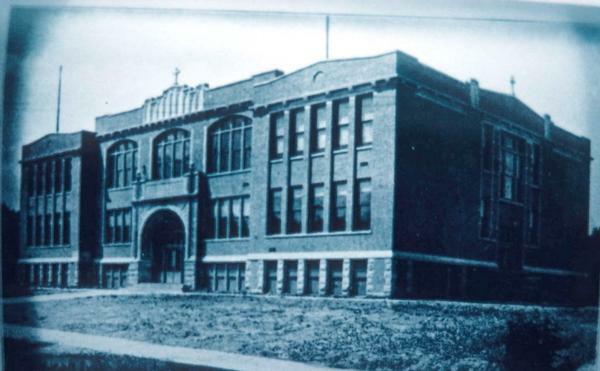 On May 13, 1915, the new school was blessed by Archbishop Ireland. The first high school graduation took place in 1918 with a class of 11 students, all of whom continued on to higher education. In 1939 the gymnasium/auditorium was added to the existing school. The cost of this project was $90,000. In 1950 the high school wing was added on to the school for a cost of $300,000. In September 1951 the 60 x 160 foot structure was ready for occupancy. The addition consists of two stories and a full basement, providing 30 additional rooms. The basement of the grade school was enlarged to provide a spacious dining hall with terrazzo flooring. In 1988, after a successful pledge drive, the gymnasium referred to for years as the “new gym” was built onto the east side of the elementary school building. The addition included rooms for kindergarten above the lobby of the gym. 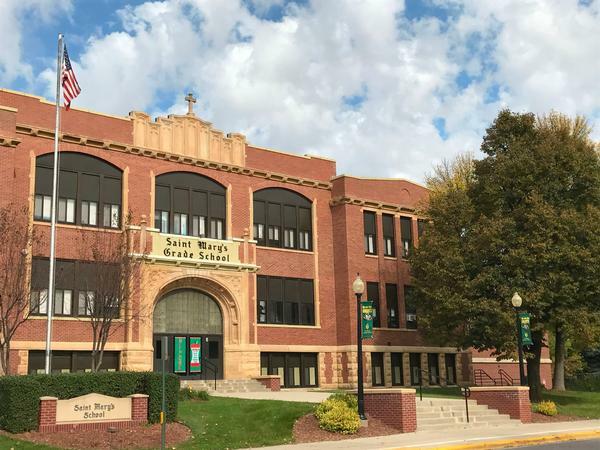 Kindergarten had been added to St. Mary’s in 1982, with a preschool program following, and space was much needed. In 1998, we received a gift from the Verna Jemming estate. Many of the sidewalks and steps in front of the school were in need of renovation and it was her wish that her gift be used for this purpose. The sidewalk and landscaping project includes a statue of our Blessed Mother. In the summer of 1999, the process of installing an elevator began to allow access between the different levels of the school. The project was completed in the spring of 2000. That summer ramps were constructed to provide further accessibility in the high school, including the auditorium. The second floor of the high school is the only area that is not handicapped accessible. In 2000, the school was presented with a major gift from the family of Richard J. Mathiowetz presenting an opportunity to add on to the school facilities. 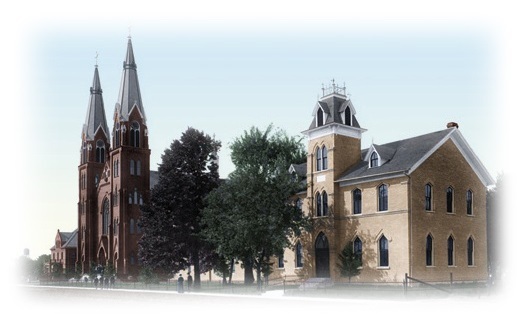 A capital campaign to raise funds for this project and several renovation and restoration projects at the church was initiated that summer. The gift from the Mathiowetz family made it possible to begin construction on the field house immediately. The field house addition, completed in February 2001, includes a new weight room and another room for storage.